FILIPINO Mark John “The Journey Man” Yap of Cagayan de Oro City stopped defending champion Takahiro Yamamoto in the fifth round by a technical knockout to capture the Oriental and Pacific Boxing Federation (OPBF) bantamweight crown last November 11 at the Central Gym in Kobe, Hyogo, Japan. The 27-year old Yap, who is now based in Osaka, Japan shocked the crowd after knocking out the crowd-favorite Yamamoto in 2:19 of the 5th round to improve his record to 25 wins with 12 losses and 11 knockouts. He also earlier twice knocked down the Japanese in the same round before referee Nobuto Ikehara finally stopped it. It was the fourth title-defence by Yamamoto, who is also ranked no. 4 contender by the International Boxing Federation (IBF). Yamamoto, 25, previously defended it successfully via a first round stoppage against another Filipino Rex “Igorot Warrior” Wao last July 20 at the Edion Arena in Osaka. “Masaya ako na naging champion na ako kasi ilang taon ko rin itong hinihintay sa career ko at pinangarap na maging champion by Gods will,” said Yap in his text message. “Pinangarap ko talagang maging champion para sa ating bayang at ibigay ang karangalan. Kasi bawat laban ko po ay para talaga sa ating bansa,” said Yap, who is now under his Japanese manager Takashi Edagawa in Osaka. Yap has vastly improved by scoring his sixth straight win. He earlier lost four of his first six bouts all in Japan since 2012. Yap, however, already fought but lost to Hiromasa Ohashi by a unanimous decision in his first outing in Japan on Sept. 5, 2010 in Nagoya. Yap went home to the Philippines and won three of his next six assignments. He then went to South Africa to face Miniyakhe Sityatha but dropped a unanimous decision at the East London, Eastern Cape on May 12, 2012. After that, Yap started campaigning already in Japan with a UD win against Akihiro Matsumoto last Sept. 23, 2012 in Ishikawa, Japan. Yap, however, lost again in his next fight against Ryosuke Iwasa on March 2, 2013 at the Korakuen Hall in Tokyo. 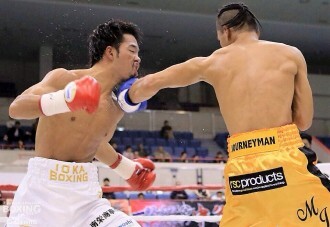 Yap bounced back with a majority decision against Ryotaro Kawabata on July 12, 2013 in Hyogo, Japan. But he again lost in his next three fights to Naoto Uebayashi (UD), Hirofumi Mukai (UD) and Yuta Uetani (TKO). Yap then started his winning ways with a UD victory against Tatsuya Ikemizu on April 16, 2015 in Osaka. It was followed by UD wins against Juan Jose Ladaeta, Shun Ishibashi and Hiryoyuki Hisataka last year. Yap also defeated Hisataka by a UD in their rematch last April 17, 2016 at the Sumiyoshi Ward Center in Osaka to earn a slot for the OPBF title. Two other Filipino fighters came up short in the same card as former world champion Merlito “Tiger” Sabillo and Allan “The Leopard” Tanada both bowed to their respective Japanese rivals. Sabillo lost by a unanimous decision to a quicker Ryuya Yamanaka in their battle for the vacant OPBF miniflyweight title. The scores of the three judges were 119-109 (Pinit Prayadsab), 118-110 (Hisatoshi Miyazaki) and 117-111 (Dan Nietes). Sabillo, 32 suffered his fourth setback against 25 wins, 1 draw and 12 knockouts, while the 21-year old Yamanaka improved to 13W-2L-0D-3 KOs. Tanada, on the other hand, suffered a 7th round technical knockout loss to defending OPBF lightweight champion Masayoshi Nakatani. The 25-year old Tanada dropped to 14W-6L-3D-6KOs while Nakatani, 27 is still undefeated with 13 straight wins and 8 knockouts. OPBF president Juan Ramon Guanzon supervised the triple OPBF championship bouts promoted by Masato Yamashita of Shinsei Promotions.